The unit was formed on 22.2.1954 with Grupo de Aviación 7 (Fighter) with de Havilland Vampire and Grupo de Aviación 8 (Bomber) with Douglas B-26C Invader. Ala Base 1 was part of I Brigada Aérea at that time. Grupo de Aviación 9 became part of this unit in 1964. At about 1997 the unit was composed of Grupo de Aviación 7 (Fighter) with F-5E/F, Grupo de Aviación 8 (Fighter) with Mirage 5 and Escuadrilla de Enlace 11 with one DHC-6 and two Lama. The unit was formed as Escudrilla de Anfibios Nº 1 on 27.7.1929 with Vickers Vendette at Base Aérea El Bosque/Santiago. On 15.11.1929 the unit moved to Base Aérea La Chamiza/Puerto Montt. The unit was expanded in 1936 and became Grupo de Aviación 5, part of II Brigada Aérea from 1937. In 1940 it became part of III Brigada Aérea at Base Aérea Maquehue/Temuco. In 1944 the unit consisted of seven North American AT-6 Texan, five Vultee BT-13 Valiant, five Fairchild PT-19 and two Avro 626. In 1949 the unit became a fighter unit, when it received Republic F-47D Thunderbolt from Grupo de Aviación 2 and moved to Base Aérea Quintero/Valparaiso. After a reorganisation in 1954, the unit was part of Ala Base 1 and was now a communication unit at Base Aérea La Chamiza/Puerto Montt again, as all remaining Republic F-47D were centralized at Grupo de Aviación 11. In 1956 the group received five Beech C50 Twin Bonanza and in 1957 five de Havilland DHC-3 Otter. In 1967 the unit became part of the recently formed Ala Base 5. The main equipment of the unit is now the de Havilland DHC-6 Twin Otter. An Escuadrilla de Enlace operates two Cessna O-2A Skymaster from Mataveri IAP on Rapa Nui. The unit was formed on 1.9.1949, but received its first aircraft at Base Aérea Los Cerrillos in Santiago only in 1954, when the de Havilland Vampire arrived in country. After a reorganisation in 1954, the unit was part of the recently formed Ala Base 1 at the new base Base Aérea Cerro Moreno at Antofagasta. In 1956 the group was reequipped with four Lockheed T-33A Shooting Star while Lockheed F-80C Shooting Star arrived in 1958. In 1967 the Lockheed F-80C and T-33A were replaced with Hawker Siddeley Hunter and were delivered to the newly formed Grupo de Aviación 9 at Puerto Montt. Grupo de Aviación 7 operated the Hunter aircraft until 1976, when they were replaced with Northrop F-5E/F Tiger II and the unit moved to its current base. The aircraft were sent to Grupo de Aviación 12 in 2009 and the unit will eventually be reequipped with Lockheed F-16AM Fighting Falcon. The former KLu aircraft arrived from 11.2010 in Chile. The unit was formed on 6.2.1948 as Grupo de Bombardeo Pesado Nº 1 with North American B-25J Mitchell at Base Aérea Quintero in Valparaiso and was later renamed Grupo de Aviación 8. After a reorganisation in 1954, the unit was part of the recently formed Ala Base 1 at the new base Base Aérea Cerro Moreno at Antofagasta. From 1954 the unit was reequipped with Douglas B-26C Invader. In 1963 the group received its first jet aircraft, the reactivated de Havilland Vampire in the fighter-trainer role. They served until 1971, when all Vampires except J-302 were retired. In 1973 the Hawker Siddeley Hunter F.71 from Grupo de Aviación 7 replaced the obsolete B-26C Invader. After these aircraft were phased out by 1995, the unit operated Dassault Mirage M5 Elkan, which they bought from Belgium. From 2006 the unit was reequipped with Lockheed F-16A/B Fighting Falcon from the Netherlands. The unit was formed in 1964 at Base Aérea La Chamiza/Puerto Montt, part of Ala Base 1, with Lockheed F-80C Shooting Star and Lockheed T-33A Shooting Star from Grupo de Aviación 7. Six years later the unit was reequipped with Hawker Siddeley Hunter F.71 while some F-80C and T-33A were sent to Grupo de Aviación 12 in 1967. Hunters of this unit played a principal role in attacking the presidencial palace in Santiago on September 11, 1973 as part of the military coup to oust President Allende. On 30.3.1975 the group moved to Base Aérea Cerro Moreno/Antofagasta. The unit was disbanded on 2.12.1981 and the Hunter were sent to Grupo de Aviación 8. On 18.3.1993 the unit was reactivated as a helicopter unit at Base Aérea Los Cerrillos/Santiago, part of Ala Base 2. 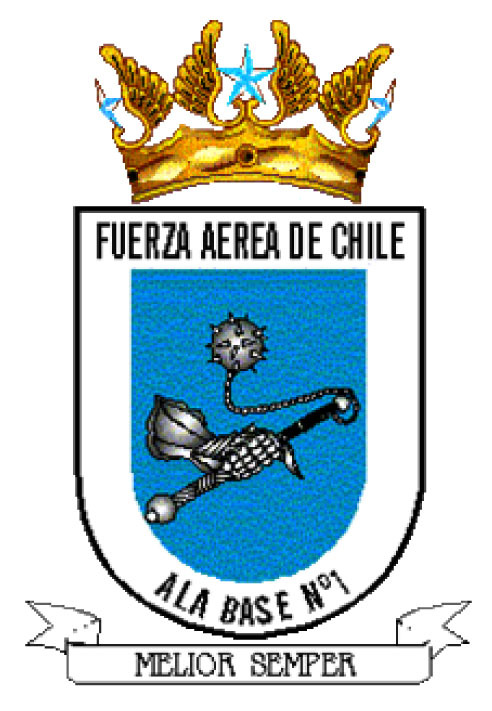 The unit was formed in 1953 as Batería de Artillería Nº 3 in Temuco, but moved to Base Aérea Cerro Moreno/Antofagasta in 1956. The group got its present name on 5.5.1975. 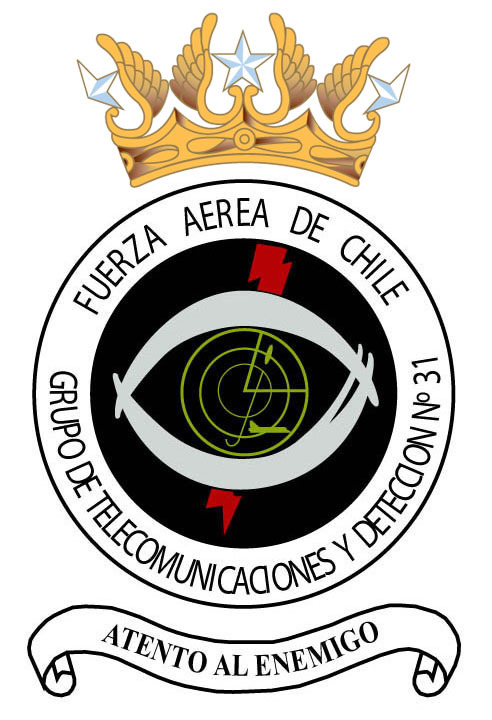 The unit was formed as Grupo de Comunicaciones y Detección Nº 31 on 14.10.1975.